Preheat the oven to 400°F. 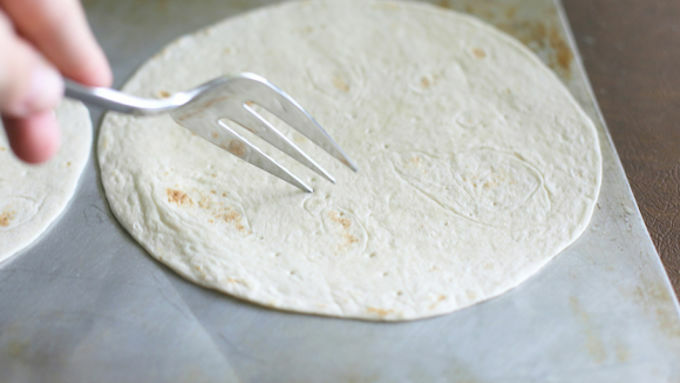 Place tortillas on an ungreased baking sheet, lightly spray with cooking spray and prick all over with a fork. This helps prevent big bubbles from forming. Bake for 5-6 minutes, until they are puffed and begin to turn golden. Remove from oven and allow to cool. Keep the oven on. In a large skillet, heat the olive oil over medium heat. Add the sliced onions to the skillet, season with salt and pepper to taste, and cook over medium-low heat, stirring occasionally, until onions turn translucent and begin to caramelize (about 8-10 minutes). 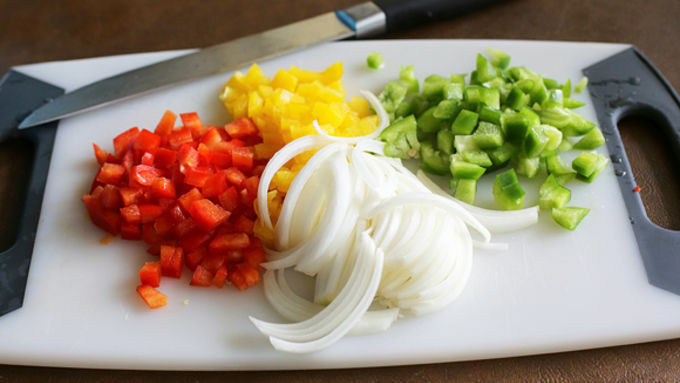 When the onions are almost done, add the diced peppers and cook just until they begin to soften. Remove skillet from heat. Spoon about 1-2 tablespoons of enchilada sauce over each of the baked tortillas. Top with the onions and veggie mixture, olives and cheese. Place them back in the oven and cook for 3-5 more minutes, until the cheese has melted. Remove from oven and garnish with fresh cilantro, diced avocado, and sour cream. Veggie Mexican? Why not? 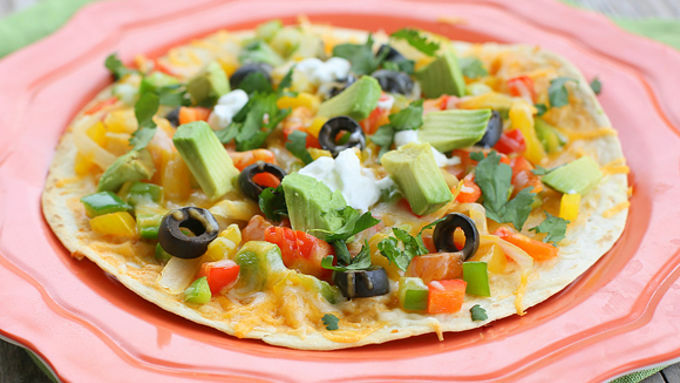 Try these open-faced veggie quesadillas, and you’ll be a believer too! I love Mexican food but hate that it can often leave you feeling lethargic and weighed down. For lunch, I like to keep it light and preferable chock full of vegetables. 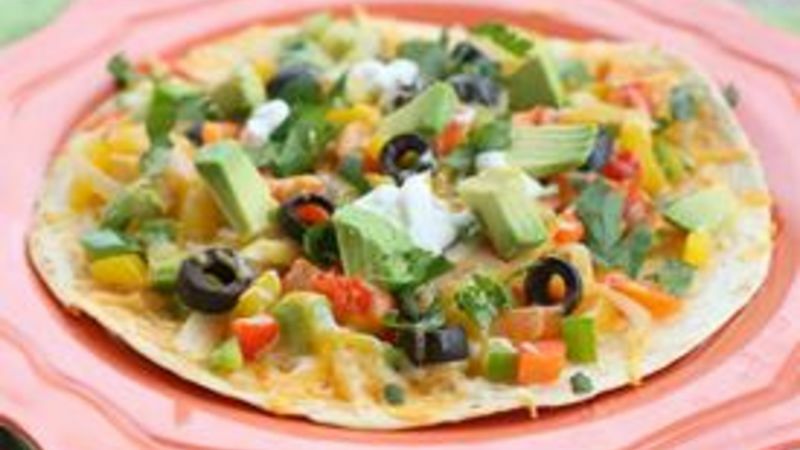 These Open Faced Enchilada Veggie Quesadillas, adapted from Tasty Kitchen, are a vegetarian feast topped with vibrant vegetables and a sprinkle of cheese. So you can have your Mexican and light meal too. By the way, I grew up in Arizona and had only had quesadillas open faced so I never knew people actually folded them over until later in life. Top with your favorite toppings. I chose some diced avocado and a little sour cream. 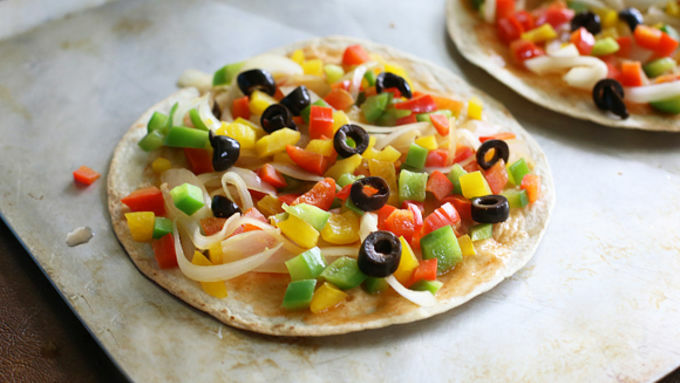 These quesadillas are full of fiber and will have you feeling satisfied!